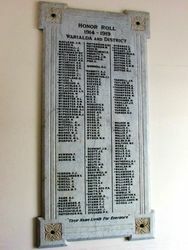 A marble honour roll commemorates those from the district who served in World War One. The roll was unveiled at the opening of the hall in 1929. 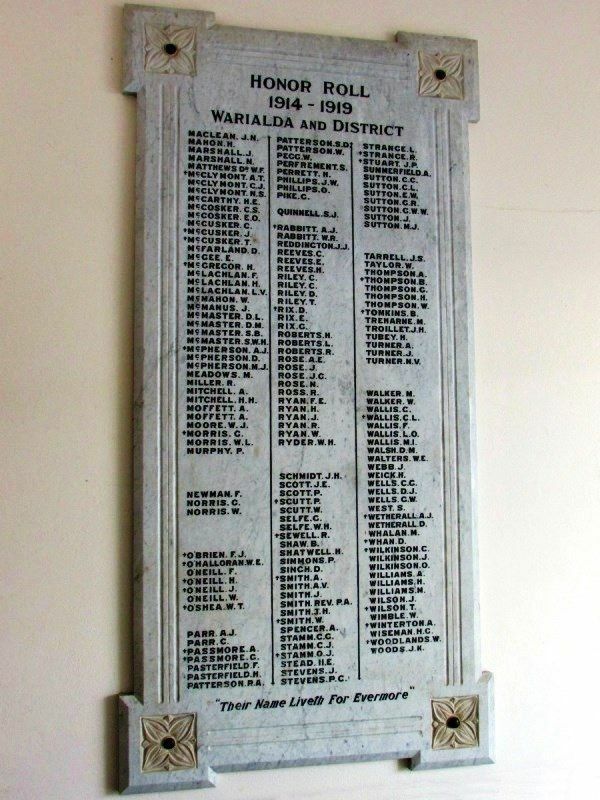 The official opening of the Warialda Memorial Hall is to take place on June 5th at 3 p.m. Sir Neville Howse has been asked to perform the ceremony, and if possible he will do so. 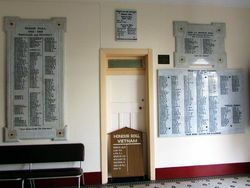 A ''stand to" of Returned Soldiers has been arranged as a token of respect to fallen comrades at the unveiling of the Honour Roll. Messrs. D. Wetherall, P. Jaeger, R A. C. Smith and J. Webb, who happened to meet in town last week, decided to suggest to all returned soldiers and ex-B.E.F. members that they assemble at 2.30 p.m. (half an hour before the opening time) to make arrangements. It will not be necessary to wear uniform and the wearing of badges, medals and ribbons is also optional. The grand opening Ball will be held at night, when a large gathering is expected, including visitors from all the surrounding districts. The music will be provided by Cavanagh's Band from Moree, while the members of the Country Women's Association who have undertaken the supervision of the supper room are making very complete arrangements for their part of the programme. On the following night the ball programme will be continued with the same music, and arrangements generally on a par with the opening night. A juvenile dance on the Friday night will afford the children an opportunity of enjoying themselves, and at the same time make the opening week impressive for their minds as well as for the adults. On the Saturday a day's sports will be held on the Recreation Ground, commencing at 11 o'clock, which along with the Competition football match (Inverell v Warialda) in the afternoon, should attract a large gathering. The programme of sports, including several horse races, appears in this issue. A grand concert on the Saturday night will complete the programme for the week.